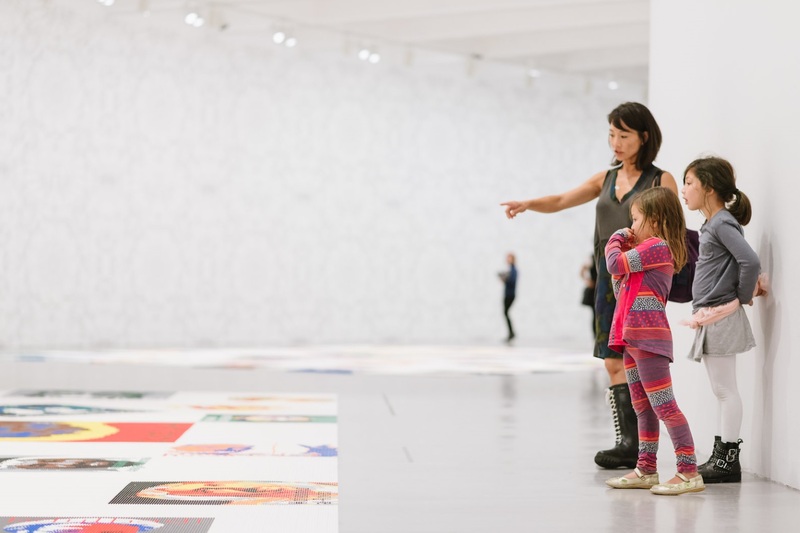 Tips for the Museum’s youngest art lovers. The Hirshhorn is a fascinating, fun and visually rich destination for kids of all ages. There’s always something to see and share that sparks a conversation, and the museum’s unique shape and inside/outside settings are perfect to explore as a family—no art history required. Contemporary art can be extremely accessible to children. Before they can read letters and words, kids can differentiate between colors, lines and forms. And while some concepts are complex, kids like to experiment, which means they can often make instant connections to the unusual materials used in contemporary artworks. Set expectations. In preparation for your visit, discuss what you might see at a modern and contemporary art museum. Go over the rules. The Hirshhorn is brimming with art made from a variety of materials, ranging from paint and bronze to more untraditional media like chocolate and soap. To protect the art, there are two simple rules everyone needs to follow: One, use walking feet inside (no running), and two, use your eyes to look at the art, not your hands (no touching the art). Tailor your experience. You can read about the exhibitions on view and identify anything that might be of particular interest. Pack your bag. While wet art supplies (paint, watercolors) are not allowed in the museum, you might consider bringing simple materials to enhance your family’s time (and give them something they can actually touch). Our suggestions include a small sketchbook and pencil for in-gallery sketching, a children’s art book (see our list below), or a piece of string to have your child mimic the lines in a painting. Get situated. For families visiting for the first time, we suggest taking a few minutes upon arrival to locate bathrooms, water fountains, elevators, and places to sit and take a break. Pace yourself. Instead of trying to see the entire museum in one visit, choose one area to focus on. Most children do best looking at only three or four artworks per visit. A stroller-accessible entrance to the building is located on the Plaza, next to the fountain. Stroller parking is available in the museum’s lobby, near the elevator. Bathrooms and changing tables are located only on the museum’s lower level. We recommend stopping there before exploring our upstairs exhibitions. For the safety of the art, food and drinks are not allowed inside the museum. The Hirshhorn’s outdoor plaza is the perfect spot for a snack break, featuring a comfortable seating area and a Dolcezza pop-up café for coffee, baked goods, and gelato on the go. Nursing moms are welcome anywhere in the museum. For your comfort, benches are located throughout the building, typically near the escalator on each floor. Look: For 2D works (paintings, photographs), sit in front of the artwork and look up and down and side to side. For 3D works, have your child walk around the work, pausing to see different angles. Talk: Identify colors, shapes, lines, and materials used. Discuss what you think the painting might be about. Think: Ask simple questions to consider personal preferences and feelings. Do you like this painting? Why or why not? How does it make you feel? Why?